THE MATRIX meets Mr Robot in the most captivating and topical science fiction film of the year. From visionary new director Royce Gorsuch comes a film that captures the voice of the ultra-connected generation, MAD GENIUS. Featuring a superlative cast, including Spencer Locke (INSIDIOUS: THE LAST KEY) and Farin Tahir (IRON MAN, CHARLIE WILSON’S WAR), MAD GENIUS is a visually-arresting and exhilarating depiction of the modern-day geniuses who risk everything to change the way society lives through science and technology. 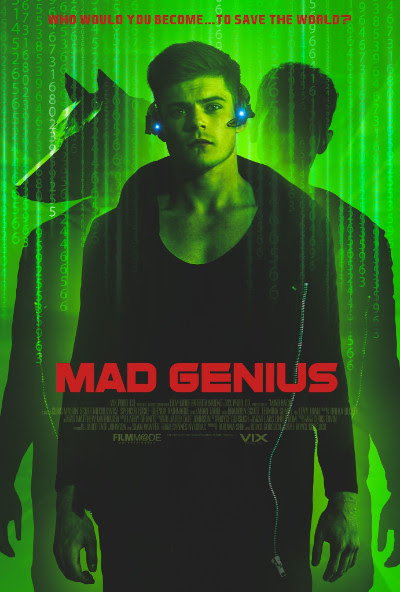 MAD GENIUS will be available on VOD and on Demand 3rd July 2018 from Clay Epstein’s Film Mode Entertainment.